Euro-zone Galloping Towards Financial Armageddon, Greece Will Take Third World Europe to Inflation Hell! Can you smell it ? There's PANIC in the Air! For instance, apparently Britain is preparing immigration controls for an anticipated flood of refugees from Third World Europe as warns Home Secretary, Theresa May "work is ongoing to deal with large movements of people in the event of the break-up of the single currency". Though these trends have been in force for the duration of the financial crisis that has resulted in net migration of more than 250k per year as I have periodically commented upon as to why the governments forecasts for UK unemployment to FALL were never going to materialise, as workers (especially the young) from across the bankrupting Euro-zone would see Britain as a jobs safe-haven outside of the Euro-zone and that was some 2 years ago!, which the mainstream with the benefit of hindsight has only recently been picking up on. The clear conclusion is that despite economic recovery underway, UK unemployment looks set to remain on an upward trajectory for the next 3 years, after which it should feel the effects of the election boom. However against these positives there will be the impact of European Migrant workers that could take up as much as 70% of the new jobs created, which suggests that even if the government is able to create its forecast 2.5 million jobs (which I doubt), then at least 60% of these jobs will go to migrant workers, leaving less than 1 million new UK jobs for British citizens. This does not paint a very rosy picture for the governments expectations for UK unemployment to fall to below 2 million. Now, the British government having realised that the opposite has subsequently transpired is panicking as it see's the potential flood (already underway) of eager willing unemployed workers from across the Euro-zone with near zero prospects for employment in their home countries (PIIGS typical have young unemployment rates of 50%!) are abandoning third world Europe for the easy to get to promised land of Britain. Whilst the financial mushroom cloud towers over Greece's economy as it prepares for an inevitable GrExit. However the rest of euro-zone has far more to fear than from just a Greek radioactive financial fallout cloud because many of the euro-zone countries have already FLASHED Financial Armageddon detonations themselves that encompasses most of the Euro-zones 330 million population. So it is no wonder that Britain's Home Office is in panicking for all of these 330 million peoples have the automatic right to travel and work within the UK. So what is the Home Office planning ? Even just a couple of percent from the 200 million (4 million persons) or so from third world europe would be enough to break Britain's economic and social back thus near instantly evaporating much of Britain's safe haven status and putting Britain firmly in the same boat as any one of the PIIGS for the reality is that Britain's Weapons of Mass Financial Destruction, it's BANKS are several orders of magnitude greater in mega tonnage of damage that they could inflict not just on Britain, not just on Europe, but the whole of the global financial system. How would the FREEZING of Britain's Borders take place? It would first start under the banner of the Home Office unable to process visitors thus border delays running first from hours, then into days and then weeks. We have already seen the Home Office test this border freeze. The next step would be to back up the operational freeze with full parliamentary backing. And the only way this would work is if the British Government were already planning to SUSPEND its membership of the EU! That is the logic conclusion, however the problem is that Britain's safe haven status may not survive a suspension of its membership of the E.U. So Britain (like most of europe) potentially faces a lose, lose situation. So, yes there IS PANIC in the air! This is my third in the current series of articles on Euro collapse, so rather than repeat what I have already written, please refer to the following for key elements. Following the result of the French and Greece elections, which that led to the conclusion that Greece would exit or be thrown out of the Eurozone. Covered the reasons why Greece had no choice but the exit and the consequences for bank depositors and key steps people should take to protect themselves from the consequences of Financial Armageddon, as my expectations are for Spain and Portugal to follow a Grexit within 6 months. 1. Greece will exit the Euro-zone, and sooner rather than later. 2. 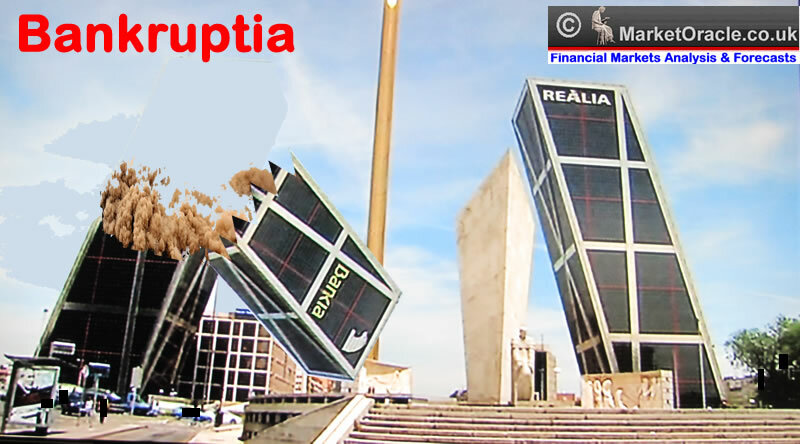 Spain and Portugal will exit within 6 months of Greece leaving. 3. There is an accelerating euro-zone wide bank run underway the price of which will mainly be born by Germany as the Bundesbank is effectively covering bank deposits of all euro-zone banks so as to prevent a total collapse of the euro-zones financial system. BRITAIN IS THE ULTIMATE LEHMAN's! Whilst many (especially in the mainstream press) may have already discounted the rhetoric from the Home office on Immigration controls, however they have failed to realise exactly how high the stakes are. The stakes are this - Britain flipping from being a safe haven to being perceived as being a Greece in a matter of days, for the markets would NOT give 2 years or so that they have given the Euro-zone crisis to play out, because when one does the sums one can see that Britain is just as bankrupt as Greece! And it would not take much to make the smoke dissipate and the mirrors to crack. The facts are Britain's total debt and liabilities are above 500% of GDP, Britain's austerity is a joke, for there has been NO real austerity which is why the budget deficit continues trundling along at £120-£130 billion PER YEAR! We see the crisis in Britain when we see demonstrators on the street demonstrating against bogus austerity, we see the crisis in Britain in a weak government that does U-Turn's on economic policy on virtually a DAILY basis. The only thing Britain has is its electronic money printing presses without which Britain would have collapsed 3 years ago! Whilst the euro-zone looks to Germany for Bailouts, Britain looks to the Bank of England to print money, to date Britain has bailed itself out to the tune of £325 billion, which is why instead of the deflation that vested interests and academics regurgitate at length we have had inflation of over 15%. You don't have to go far to see that the mainstream press and blogosfear remains populated with delusional deflationists, devoid of market sense that are in a perpetual state of denial to the INFLATION that has followed the great recession of 2008-2009. They MIS-INTERPRET the continuing Low bond yields for the likes of US, UK and German bonds amongst many non PIIGS nations as evidence for Deflation when common "market" sense dictates that ALL of these BELOW inflation rates are as a consequence of monetization of their respective country deficits and debts (accept Germany where it is the trade surplus). The UK is a prime example of this with an unbelievable bond yield of just 1.50% which is HALF the UK's official Inflation rate! Are these fools saying 3% INFLATION (and it has been as high as 5%) is DEFLATION? An even greater example of the Deflation Delusion as iterated by those devoid of any market sense is the example of GREECE, where despite economic meltdown of more than 16%, Greece at the same time has suffered INFLATION of about 10% over the past 3 years! If Greece had the ability to print money than Inflation would have been near 100%! Which ordinary Greeks fully understand which is why they are desperate to remain within the euro-zone to protect themselves from the Inflation Hell that their corrupt politicians would unleash. How do book peddling academics explain that ? They can't! Instead they ignore it and continue merrily along their way spouting utter claptrap based on theories which NEVER match the REAL WORLD! Which is why economics as you know it and as you read and watch it on the news programme's is nothing more than government propaganda, economics is nothing more than pure government propaganda. And all that academics do is to regurgitate what the propaganda schools of thought state. It's as if they say it for long enough then people will become blind to the REAL WORLD! Maybe most people HAVE been brainwashed to believe that they are experiencing deflation despite the reality of their grocery bills rising by near 10% per annum! What the academics FAIL to understand as I have been writing of for several years as to why we will have an INFLATION MEGA-TREND is because Economic Recessions, Depressions and Meltdowns result in the destruction of SUPPLY that is GREATER than the destruction of DEMAND! Market Sense dictates that when people lose their jobs, even though they no longer produce anything, they do still CONSUME heating, eating and the rest of ongoing activities that are funded by debt and deficits and sale of assets. So whilst production reduces but in many respects consumption goes on resulting in INFLATION, because no matter what the governments call it they are effectively printing money to finance the ongoing consumption of the increasing number of un-productive persons. You WILL NOT FIND That Economic REALITY anywhere in Academia, it is beyond the comprehension of economic theory. Instead crackpot Keynesian's believe even more money should be borrowed and spent on unproductive activities that ultimately accelerates the trend towards bankruptcy. The Keynesian answer to the debt crisis is to borrow even more money and spend your way out of the crisis by GROWING the size of the state. There is no logic to Keynesianism, because you cannot borrow and spend your way out of debt crisis! All it results in is INFLATION. Which is the primary tool for governments to buy votes, i.e. print money or debt and buy votes at the next election the consequences of which is INFLATION. The problem is this and it is relatively simple. The problem is that the real reason there is an ongoing debt crisis is because the State is too big. And what the Keynesian's are advocating would make the state even larger when the answer is the exact opposite which is to SHRINK the STATE. That is what you need to do to get out of a perpetual all consuming debt crisis. Perhaps many years from now with the benefit of hindsight we will see professors such as Krugman looking in their rear view mirror to explain what came to pass in our time, but for now theory dictates we should have deflation and therefore Keynesian policies on how to deal with it are in play the world over as official economic doctrine because Keynesian economists (all academic economists) are vested interests who are PAID to follow a school of thought without which they would be literally UNEMPLOYABLE! ALL THEORY AND NO PRACTICAL EXPERIENCE. Such theory based economic propaganda was most recently demonstrated by Mervyn King, the governor of the Bank of England who effectively blamed the euro-zone for HIS failure to keep UK inflation at 2%. "We have been through a big global financial crisis, the biggest downturn in world output since the 1930s, the biggest banking crisis in this country's history, the biggest fiscal deficit in our peacetime history, and our biggest trading partner, the euro area, is tearing itself apart without any obvious solution. "The idea that we could reasonably hope to sail serenely through this with growth close to the long-run average and inflation at 2% strikes me as wholly unrealistic,"
When the real reason for high UK inflation is because of the £325 billion of money printed to date by the Bank of England for the banks to buy government debt and thus kill two birds with one inflationary stone (monetize government debt and generate artificial profits for the bankrupt banks), and despite what the MPC committee states in its minutes, THEY WILL PRINT MORE, and sooner than most can imagine, because as I wrote several years ago now, the more Quantitative Inflation a government instigates then the more it will have to print in the future because the economy becomes addicted QE or more accurately QI all the way towards a high or even an hyperinflationary panic event! For instance it now takes the UK economy being in recession for the Inflation rate to fall back to the Bank of England's UPPER maximum limit! That shows you an economy that drug addict style has become addicted to QE, so when they say they are going to stop QE, in reality they cannot until the deficits cease to exist. But QE has the effect of delaying deficit reduction pain and hence why the UK is in an INFLATIONARY DEPRESSION. A bad set of unemployment figures Friday has prompted the usual suspects to start crowing loudly again about the Deflation threat. 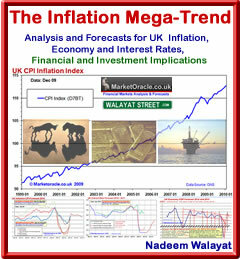 However the below CPI graph reveals the truth about so called US Deflation. The facts are that even on the official figures the US has experienced Inflation of nearly 10% over the past 3 years, with the trend trajectory little different to that which preceded the Great Recession of 2008-2009, whilst shadow stats implies its near 10% per annum. The Deflationist's only tend to refer to CPI whenever it dips to start warning that Deflation is imminent (search Google), which tends to occur just prior to its next acceleration higher, just as we have been witnessing since the start of the year that CPI right on cue is accelerating higher despite a slowdown in the US Economy, which is basically for very similar reasons to Britain being in an money printing induced Inflationary Depression. There are many that say (usually the ones who are consistently wrong) that it does not matter if we have Inflation or Deflation, when I know from my experience that Inflation or Deflation is the most important economic factor, because everything ELSE in the economy and markets is LEVERAGED to Inflation. So in my opinion those that say it does not matter have NEVER traded or invested for any significant length of time, for if they had they would see the impact that the Inflation trend has on markets and economies which is why it remains my primary economic indicator to attempt to map out several years forward, I don't do all this work on Inflation for fun, I do it because it gives me an edge. Also it is no coincidence that controlling Inflation is the primary remit of virtually EVERY central bank, even if as a result of failure they try to hide the real rate of inflation from their general populations. The bottom line is this that Governments need inflation to survive, so they will never allow Deflation to persist and they have the money printing presses to ensure there will NEVER be a persistent trend for Deflation, which is why even Bankrupt economic meltdown Greece of today has Inflation, as I wrote in the intro to the Inflation Mega-trend Ebook well over 2 years ago (Free Download). We are all repeatedly told at length by the mainstream media how the euro-zone could collapse as a consequence of the euro-zone debt crisis. However the crisis is not primarily about debt but about currency. The EURO IS the reason for the debt crisis and not the other way around as is the consensus view. This flipping of mainstream economic reality may be difficult to grasp at first, but contemplate this - Only ONE country in the Euro-zone has a currency and that country is Germany because effectively only Germany can print euro's. Therefore none of the other countries have a currency, they are ALL effectively using Deutschmark's, because it is Germany which stands behind the Euro as we know it today. This currency crisis is a re-run of the Euro's predecessor the ERM, which collapsed in spectacular style during the early 1990's as a consequence of over valued exchange rates that did not reflect individual economic realities which is precisely where we stand today. The economies of Greece and the rest of the euro-zone are OVER VALUED against one another and most importantly Germany, and because they have no currency they cannot devalue and inflate away their current state of over-valuations, instead the ECB (Bundesbank) prints euros to delay their bankruptcies because the Euro ensures there IS NO MECHANISM for correcting the imbalances and thus the only outcome is economic collapse. 1. Germany to exit the Euro-zone. though I think it is too late for this option. I first mentioned this in May 2010, so 2 years of euro-zone dithering has made this solution now far less effective and probably would no longer work, the trends in motion are now too severe for a Euro-zone less Germany to survive. 2. For the Euro-zone to breakup. This is the most probable outcome and will likely happen in stages (or so the politicians hope), with Greece first then Portugal and Spain and others as also covered in Part2. Though the risk of financial armageddon, a fast pace total collapse is pretty high. The current situation that the politicians are hell bent on sticking to is UNSUSTAINABLE. Because Euro-zone EXIT beckons for ALL Member states! Greece Leads the Way - "You Give us 100's of Billions of Euro's or We All Go to Hell Together"
Greece is burning through about 100 billion euros a year just to delay bankruptcy, not prevent it. The Greek elections illustrate that the people have no power, they can elect whomever they choose but because they do not have their own currency the governments have no power to do anything. This lack of political power is shown in the opinion polls, where Greeks vote overwhelming for an end to austerity but at the same time vote to stay in the Euro. 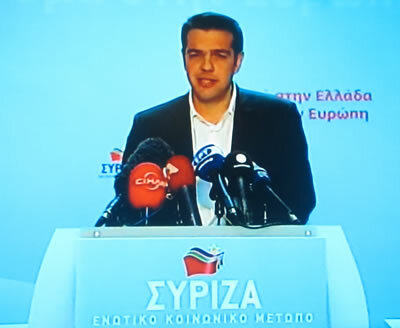 The facts are that they cannot end austerity and stay in the Euro. This contradiction is being played out in the run up to the next Greek election where Sypris is expected to form the next government and it has built it's whole election run on the basis of this contradiction which is for an end to austerity but remain in the Euro-zone. Effectively Greece IS black mailing Germany to the effect that they want Germany to bankrupt itself so that the Greeks can return to living beyond the countries means whilst enjoying the security of the Euro in terms of retaining purchasing power. The bottom line is that the mass of Greeks who buy into Sypris are delusional if they think that Germany will bankrupt itself for Greece. Greece today is several orders of magnitude more bankrupt than it were 2 years ago when the credit markets first closed their doors to Greece. In the meantime all that has happened is that several hundreds of billions of Euro's have been flushed down the toilet as the price paid for delaying collapse of the euro-zone, and even if Greeks vote for austerity rather than Sypris then they will STILL eventually leave the Euro-zone because of the facts mentioned earlier that there is no mechanism within the euro-zone for correcting imbalances between member states. Greeks need to understand one fundamental fact and that is that THEY WILL LEAVE the Euro-zone no matter if they chose to or not! The decision is NOT their's to make! As mentioned in Part 2 - The expected Sypris Government, will come to be seen as those responsible for Greece's exit from the euro-zone and national bankruptcy and by virtue of the consequences of which will probably come to be seen as one of the most hated governments in Greece's long history. It will mark the end of Sypris and much of the left along with it as Greece will likely lurch to the far right for solutions from high if not outright hyper-inflationary collapse that will follow. When Will Greece Exit the Eurozone? The clear date in mind of most is following the results of the 17th June 2012 election. My view remains that on its own a Greek exit could still be inline with that which I mapped out in Part2, namely following a series of summits in July and August. However, the problem is that the decision could be taken out of the Euro-zone politicians hands as a consequence of other countries entering crisis point (Spain) forcing the issue. So whilst the schedule may point towards an late August / Early September exit, euro-zone reality dictates you should be ready for a high probability of a Greek exit within a matter of days of the 17th June election. Many commentators correctly state that Greek debt is denominated in Euro's so a return to the Drachma would not help Greece as the debt burden would be even higher. Whilst technically correct, however, they are wrong in this assumption because of the fact that countries that have their own currencies can choose to do anything they want to. They can choose to default on the debt regardless and not pay any or perhaps a penny on the euro. Off course what will actually happen is that the ECB will take on most of the debt that Euro-zone banks are still exposed to prevent bankruptcy of the Euro-zone whilst at the same time cover the losses of other Euro-zone central banks because they cannot print money so in effect Germany will pay a price of at least Euro 300 billion for just Greece exiting the Euro-zone. V Shaped Economic Recovery Following Greece Exit? Greece with its debt slate wiped clean (by default) and its own currency to print to infinite extent will experience severe pain for the first year or so then barring social collapse should experience a sharp economic rebound as a consequence of no longer having a debt burden to finance, off course the credit markets will remain closed for many years, and the purchasing power of the Drachma will have collapsed so the economic recovery in real terms will be pretty artificial but at least it will make Greeks start to feel better for the future as economic data such as unemployment starts to improve (helped by the fact that hundreds of thousands of unemployed Greeks will have migrated elsewhere).